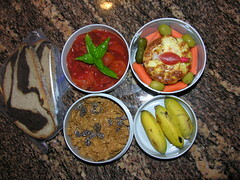 Thursday, August 30, 2007, finds these items in my Mr. Bento. Entree is chicken bratwurst, vegetarian beans, and habanero-sauce-fish. The salad has yellow tomatoes on top, blue cheese dressing on the side. Mixed grapes for dessert, and Trader Joe's sourdough in the breadbowl. The grapes are from Whole Foods -- they have a tri-color box. Got the tomatoes and brat there, too, but the greens and bread are from TJ's. 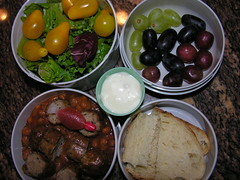 Midweek, here's what's in my Mr. Bento for Wednesday, August 29, 2007. For breakfast, there's raisin bran. 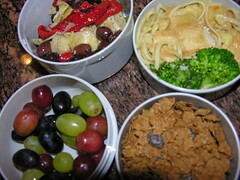 For lunch, there's lemon basil chicken, linguine, broccoli, artichoke salad, and a rainbow of grapes. 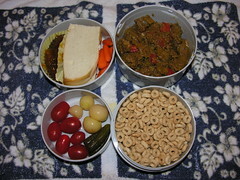 Spread out are the 4+ containers in my Mr. Bento for Tuesday, August 28, 2007. The sandwich is honey-baked sliced turkey and swiss cheese on a baguette, the spread is wasabi mayo from my kewpie bottle, the soup is Whole Foods organic vegetable broth with mini-carrots, and the breakfast bowl is shredded wheat. Right is Left. Up is Down. Good is Bad. Truth is Falshood. Friday, August 24, 2007, already? 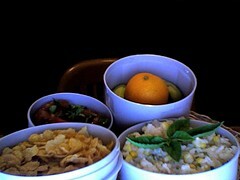 Well, here's what'll be in my Mr. Bento. 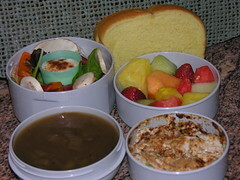 There's roast chicken salad to spread on potato bread, a bowl of cut up fruit, french onion soup. and a garden salad with blue cheese dressing. Mr. Great Stone Face is happy, because Mrs. Great Stone Face (a/k/a Ms. Sea Turtle) is home from her trip. 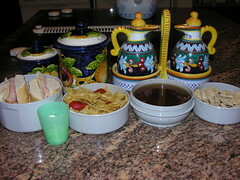 Here are the celebratory items for Weds., Aug. 22, 2007. Cheerios for breakfast. A relish bowl with Vietnamese pickled eggplant, sweet pickles, tomatoes, and carrots. Dessrt is my darling clementine and chocolates. Potato bread to make a crab salad sandwich. 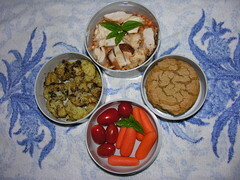 Here's what's in my Mr. Bento for Tuesday, August 21, 2007. Hard to see from this angle, but the onigiri's a star. Here's where I'll be going in October. 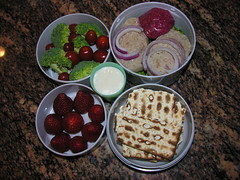 For the final day of the week -- Friday, August 17, 2007, here's what I'll be taking in my Mr. Bento. Main course is gefilte fish and horseradish. Side dishes are broccoli and tomatoes, with a dip in bliue cheese dressing. Starch is matzoh, and dessert is strawberries. Mr. Habanero Hotsauce is visiting the Mr. Bento contents for Wednesday, August 16, 2007. 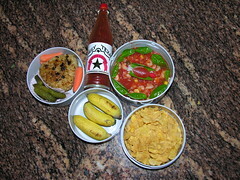 The lunch bowl has stewed tomatoes, shrimp, and roasted corn, topped with basil leaves and a habanero hotsauce bentofish. There are also yaki genmai onigiri with carrots and sweet pickles, three mini-bananas, and cornflakes. Guess what's for breakfast and what's for lunch. 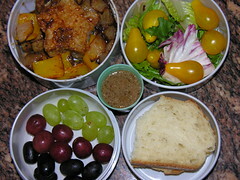 Middle of the week and here's what's in my Mr. Bento for breakfast and lunch on Wednesday, August 15, 2007. There are stewed tomatoes in bowl 1. 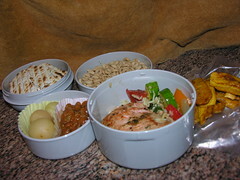 There are a shrimp + edaname + corn frittta with hotsauce bentofish and carrots, olives, and pickles in bowl 2. Bowl 3 has raisin bran, and bowl 4 has mini-bananas. 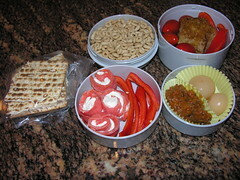 My Mr. Bento will have these contents on the ides of August, 14 Aug. 2007. The shredded wheat and fruit bowls for breakfast, the salmon salad to spread on the bread for lunch. The relish bowl for snacking. 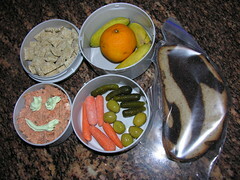 Here's what I'm taking in my Mr. Bento to start the new week, on Monday. August 13, 2007. There's cornflakes for breakfast, with a mini-banana or two. There also a clementine, an heirloom tomato dressed with olive oil + salt + pepper + basil, and some Whole Foods' fresh corn risotto. 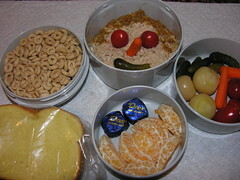 My Mr. Bento will have a wide variety of contents for the final workday of the week, Friday, August 10, 2007. My first attempt at molding eggs,using the Williams-Sonoma ice cream cookie molds, as suggested by biggie. Definitely follow her advice to use extra-large or jumbe eggs. The large eggs just didn't fill the molds up enough. The brown tinge is from soaking the eggs in tea, with the highlights applied with katsu sauce. 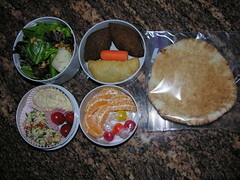 Last of the kibbeh plus other stuff in my Mr. Bento for Wednesday, August 8, 2007. 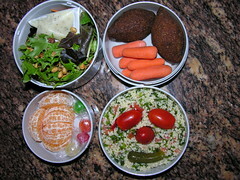 There are carrots, garden salad, clementine and candy, and happy couscous salad. 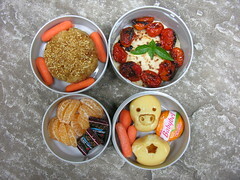 Tues., Aug. 7, will find similar contents in my Mr. Bento. The cheese pie, kibbeh, couscous salad, and baba ghanoush are from Cedar Cafe, located in Burke, VA.
Upper left is a salad with tomatoes, soynuts, sunflower seeds, and poppyseed dressing. Upper right are my darling clementine + candy. Bottom left are kibbeh and baba ghanoush. 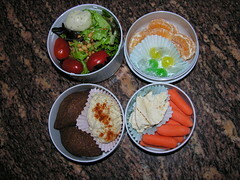 Bottom right are pita and carrots. The bottom layer is a container of turkey over vegetarian baked beans. Next up is a contianer of carrots and tomatoes. The big pop-on lid container has cauliflower pan-fried in cumin butter. Topping them all off is a container with two ginger chewies. Not pictured are the small Tupperware container of wasabi mayo for vegetable-dipping and the bentofish of habanero hotsauce for the turkey and beans. I added them after the photo was uploaded. 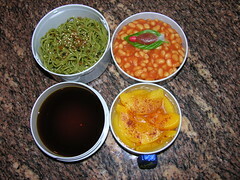 Wednesday, the second day of August, 2007, and Mr. Bento has a hot breakfast and a cold lunch. The British Heinz beans has a slice of toasted country white bread underneath. The fish lying on the basil leaf is filled with Tabasco sauce. The zarusoba is topped with furikake and is waiting to be dipped in the tsuyu bowl.